Jim Swisher’s love for the Wake Forest University campus is not the result of his lawyer’s mind objectively weighing the pros and cons of his years there. It’s a visceral love that dates to the summer he first visited the newly opened campus in Winston-Salem, with its spindly trees and patches of red clay left by the recent construction. Swisher (’61, ’62) came as an undergraduate and was admitted to the School of Law during the second semester of his junior year–a tribute not so much to his extreme intelligence, he said, but to Dean Carroll Weather’s flexibility toward an eager student. 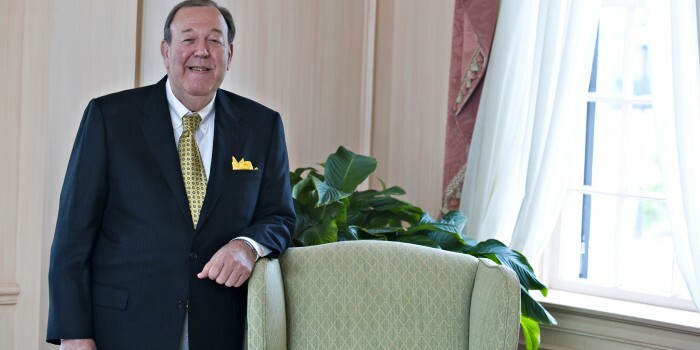 Swisher, a partner in Cahoon & Swisher in Greensboro, has served on the Board of Visitors and he has been a major contributor to the transformation of the Worrell Professional Center. His gift will go toward the creation of the new boardroom. His reason for that particular gift? The School of Law asked him. He remembers his years at the School of Law as golden ones, full of the excitement of being on a new campus, a sense of fellowship and a wonderful cadre of professors. Professor Robert E. Lee was one of the school’s characters and a man Swisher describes as having a tremendous personality. On his second day at the School of Law, Lee pulled Swisher aside after his class in domestic law. Lee had written the textbook for the course and Swisher was the only student who had not yet bought the book. Shortly before graduation, his professors steered Swisher’s course by putting him in contact with Robert Cahoon (’42), the man who would become his partner, until Cahoon’s death in 2006. He and Cahoon maintained a general law practice, which fit in perfectly with his liberal arts background, interest in the community and Wake Forest training. His brother, the late Roger Swisher, served the town of Kernersville as mayor for more than 20 years. He was able to hit the ground running with his School of Law degree, Swisher said. It’s important that Wake Forest enable a new generation of students to do the same in a field that is rapidly changing and increasingly complex.